Zeemaps is another good website to use with students to create, publish and share interactive maps. 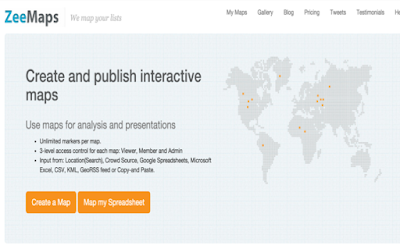 Zeemaps allows you to visualize geographic data and customize your maps the way you want. You can for instance create maps of places you plan to visit with students or share maps of specific locations you have visited. And although it displays Google Maps, Zeemaps is not affiliated with Google and has its own servers where all created maps are stored.